With fellowship training in diabetes, Dr. Gangupantula specializes in providing diabetes management services. Type 1 Diabetes involves a severe lack of insulin, requiring critical care and management. 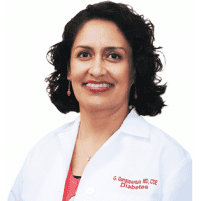 Schedule an appointment at Valley Diabetes & Obesity in Modesto, California to have Dr. Gangupantula assess your personal needs. She will guide you through the proper steps to maintain your health while acknowledging your personal experience. Dehydration - Extra sugar in your blood prompts your body to urinate more frequently in an effort to get rid of it. Your body dehydrates as large amounts of necessary water leaves your body. Weight loss - Calories exit with the glucose that leaves your body, causing you to lose weight. Diabetic ketoacidosis (DKA) - Without enough glucose, your body breaks down fat cells instead, creating acidic ketones. This life-threatening combination of extra glucose, dehydration, and acid buildup is known as ketoacidosis. Damage to your body - Over time, high glucose levels can harm the nerves and small blood vessels in your eyes, kidneys, and heart. Dr. Gopika Gangupantula provides measures for insulin management, ensuring minimal variability in blood sugars to prevent hyperglycemia and hypoglycemia. Type 1 Diabetes is relatively rare, with only about 5% of the diabetic population affected. Statistically speaking, men and women are equally prone to having it. Its onset usually occurs among individuals under 20, although it can occur at any age. The explicit factors that cause Type 1 Diabetes aren’t fully known, but genetic factors are known to play a role. Environmental factors also are observed to have an effect. In the case of autoantibodies, for example, a virus signals your immune system to attack your pancreas. Type 1 Diabetes can also be a comorbid condition alongside other autoimmune diseases. Type 1 diabetes is a serious condition requiring medical treatment. ContactDr. Gangupantula as soon as you notice any symptoms of this condition.